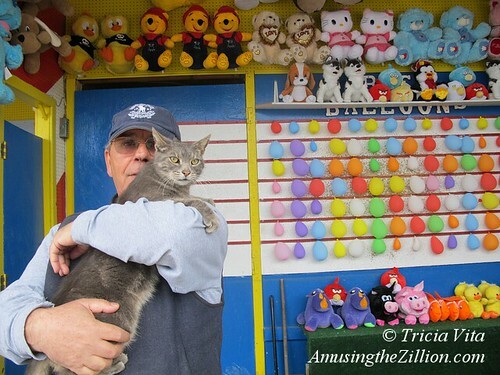 We’re sad to report that our friend Manny Cohen, longtime owner of Coney Island Arcade, and his beloved and much photographed cat Target are about to leave Coney Island forever. As ATZ reported previously, they’re moving to Vegas. Last week we took a few farewell photos but put off saying goodbye. After 22 years, Manny was evicted by the landlord (no, not Thor Equities) and has until the end of the month to leave his spot on Coney Island’s Bowery. The car with Target’s roomy traveling cage and a harness for walks in rest areas along the way is packed. Manny’s boxer machines have already been shipped West. “It’s time for me to move on. I don’t have the arcade anymore,” Manny told ATZ in February. Since May of 2010, when a terrible fire destroyed his amusement arcade on the day that workers sent by the landlord tarred the roof, Manny’s business has focused on selling new arcade machines and parts, which he will continue to do in Vegas. He has also operated a few games on the Bowery. ATZ’s very first post, on April 9, 2009, featured a favorite photo of Target on the counter of the Balloon Dart. Goodbyes are hard. Instead, we’ll look back at some of what we’ve written over the years. When we started working in Coney Island, Target the Cat was already sitting on the counter of Jimmy’s Balloon Dart on the Bowery calling the people in to play. Some girls can’t walk by without stopping to pet him and ask his name. Next thing you know they’re busting balloons and winning prizes. The gregarious cat is world-famous thanks to having posed for many photographs including one that appeared in the New York Times. Target and his late sister Targeretty were born at Spook-A-Rama in Deno’s Wonder Wheel Park. When a worker heard mewing and went to investigate, he found the motherless kittens. They were kept warm with a portable heater and fed with a dropper. Two weeks later, Manny Cohen adopted them and raised them at the arcade. 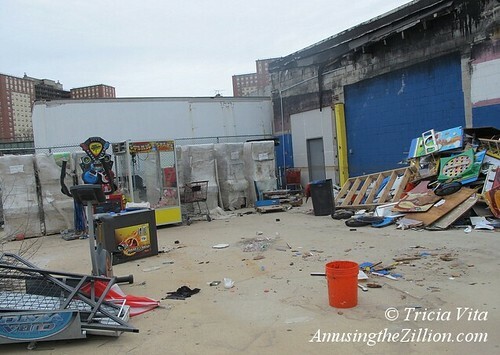 In Coney Island, Target has used at least two of his nine lives. He escaped the arcade fire when the firemen cut the gates. They found his sister Targeretty in the office where she probably died of smoke inhalation. Target and his feline friend Pretty survived the flood waters of Sandy by climbing up to the rafters where they were marooned for days until the electric lock could be picked. We wish Manny Cohen and his lucky cat all the best in their new home. 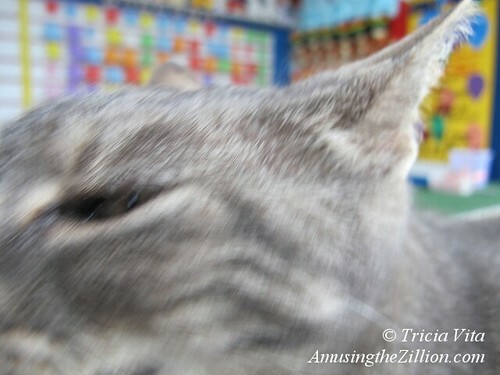 We’ll especially miss taking photos of Target working the Balloon Dart with Jimmy, asking to be petted and rubbing his face against the lens. 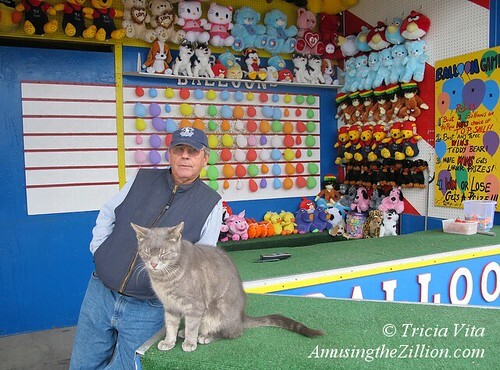 Will the famous Coney Island Cat miss Coney? In Las Vegas, Target will prowl the casinos on a leash and hunt chipmunk, says Manny.